• Set of 3 Woodland Animal Nursery prints reproduced from my original digital graphic designs. 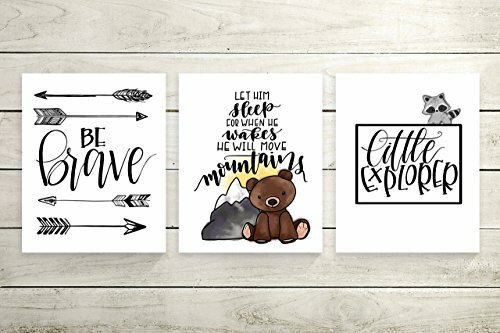 Add a little whimsy and a little decor to any little boy's nursery with our three piece graphic handlettered "Little Explorer" "Be Brave" and "Let Him Sleep" prints. • Size: 8.5x11" - additional sizes available upon request. • Print Format: Portrait / Vertical - Printed with a minimum of 1/2" border of white space. • Print Replacement: If you'd like to swap out any of these for other prints in my shop, please send a direct message describing which prints you would like to swap out. • Shipping: Mailed in rigid mailer to protect during shipping. US orders typically arrive 3 - 5 days from shipping date by USPS standard post. Please contact if there are any issues with your purchase to provide us the opportunity to remedy the situation. If you have any questions about this product by June & Lucy, contact us by completing and submitting the form below. If you are looking for a specif part number, please include it with your message.